The public outcry attending President Trump’s attempted travel ban from seven radical Muslim states, designed to prevent foreign terrorists from entering the country, has diverted attention from the longstanding danger of homegrown jihadists. As early as 2007, the New York Police Department (NYPD) released a 92-page report documenting the extent of al-Qaeda-linked homegrown jihad in Europe and the United States. The Obama administration, however, went out of its way to ignore, deny, and whitewash any homegrown terror that smacked of Islamist violence. But a decade later, al-Qaeda has been all but eclipsed by the Islamic State (ISIS), which has skillfully used social media to become the foremost purveyor of jihadist indoctrination in the West, creating a “virtual caliphate,” extremely dangerous and easily accessible to vulnerable men and women from a variety of backgrounds in a manner al-Qaeda was never able to achieve. Even were all territory now under ISIS control to be retaken, this virtual caliphate could continue to pose a major threat. Screenshot of ISIS Twitter account. Twitter is by far the platform of choice for ISIS supporters, who have found ways to outmaneuver Twitter’s continued closing of jihadist accounts. While the NYPD’s report noted the Internet “as a driver and enabler for the process of radicalization” for al-Qaeda, this was largely limited to the terrorist group’s use of chatrooms, which represent only a small portion of the Internet’s potential. Indeed, according to a 2011 Rand Institute study, while al-Qaeda “does 99 percent of its work on the Internet,” its scope is limited to merely a few cyber platforms, demonstrating its simplistic utilization of the Internet. By contrast, ISIS has taken a more advanced approach, targeting and utilizing a number of novel platforms to preach its jihadist ideology, thus blending tradition and technology in a sophisticated manner. Running a $2 billion campaign thanks to its oil monopoly in Syria, the group expertly commands usage of the cyber community in a multitude of forms: Twitter is by far the platform of choice among forums such as Facebook, Google, Tumblr, Kik, WhatsApp, and more. Coupled with its use of more under-the-radar messaging apps such as Telegram (which is encrypted) and Surespot, ISIS is able to maintain a constant and steady presence on the Internet. Constant accessibility. Not only is ISIS using nontraditional and innovative cyber platforms, but it is also ensuring continuous access to their content. Its supporters have found ways to outmaneuver Twitter’s continued closing of jihadist accounts, notably via Bait al-Ansar (literally, the House of Supporters), which allows users to recreate new accounts quickly without having to enter new information. In fact, as shown by a 2015 George Washington University study, many jihadists view account suspensions as “badges of honor.” Twitter campaigns—such as “Hashtag Jihad”—are also utilized to encourage Americans to join the fight in Syria, according to the Middle East Media Research Institute (MEMRI) Cyber and Jihad Lab. At times in 2015, the U.S. government was battling about 90,000 tweets a day, according to a State Department spokeswoman; and while a militant may be killed, a tweet cannot. Highly popular sites are not the only form of jihadist communication. 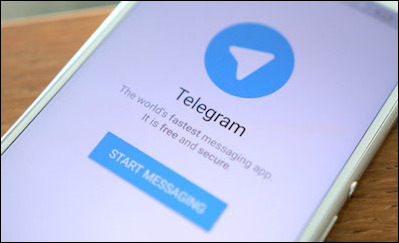 The more covert Russian messaging app, Telegram, which provides almost complete anonymity to its users and relies on client-server/server-client encryption, dedicates whole channels to ISIS and its ideology. “The Nasheed Gallery,” a channel on the app, allows supporters (and potential supporters) to listen to jihadi nasheeds, also known as Islamic songs. The songs are a “main factor in reinforcing the group’s narrative and attracting new recruits,” according to MEMRI. This channel and channels similar to it can be accessed anytime, granting potential supporters unlimited access to jihadist ideology. The radicalization echo chamber. The success of ISIS’s Twitter campaign can be attributed to its use of the platform as a “radicalization echo chamber,” namely the sharing and spreading of jihadist propaganda for continued consumption by other supporters and, even more importantly, potential supporters. The chamber is comprised of three user groups: nodes, amplifiers, and shout-outs that can best be understood as a tier-like system. The nodes (first tier) are by far the loudest and most authoritative voices in the social media jihad realm, tweeting out videos, phrases, articles, etc. The amplifiers then engage the content further by retweeting material from the nodes; and while not necessarily presenting new material and propaganda, they actively utilize the node twitter accounts. Finally, shout-outs allow users to become familiar with ISIS accounts by giving them a “shout out,” or naming them in tweets, thus promoting the original node accounts, making the shout-out users “vital to the survival of the ISIS online scene.” The average ISIS Twitter account has one thousand followers, and the echo chamber process is an integral part of ensuring the continued success of the accounts. Resulting recruit success. By constantly capitalizing on modern technology, ISIS supporters are able to continually engage the online community as “keyboard warriors.” However, the online jihad is not merely talk. 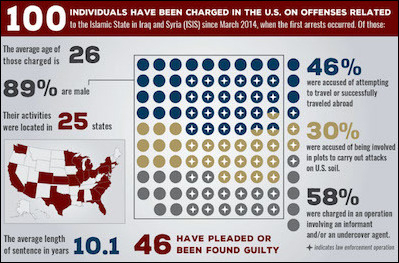 Between March 2014 and November 2015, 82 people within the United States were arrested on charges related to promoting terrorism or attempting to initiate an attack. Of the 82 individuals, 39 (47.5 percent) had a strong social media presence prior to their interdiction. Analyzing the recruitment rate is an integral part of measuring ISIS’s reach, but the demographics of its supporters are an equally important way to understand its success in U.S.-based radicalization. Although there are some similarities among individuals radicalized by al-Qaeda and ISIS, the latter group has managed to broaden the demographic base in a number of ways, a reflection of its successful social media outreach campaign. The NYPD report found most al-Qaeda supporters to be second or third generation males under the age of 35 from “Middle Eastern, North African, and South Asian cultures,” highlighting that “middle class families and students appear[ed] to provide the most fertile ground for the seeds of radicalization.” By contrast, most ISIS supporters are males under the age of 26, from a wide range of ethnic backgrounds and social classes. Understanding the ISIS audience highlights how the organization is poised to continue to target successfully a young and extremely vulnerable demographic. Most ISIS supporters are males under the age of 26, from a wide range of ethnic backgrounds and social classes. This appeal to youth and diversity among foreign fighters can, in part, be attributed to ISIS’s use of social media. Graphic: GW Program on Extremism. Age. At a quick glance, the comparative demographic overview of radicalized Western supporters from al-Qaeda and ISIS seems nearly identical, with “young and male” being the most obvious description. However, to place the supporters of both groups in the same category is to ignore the youthful trend of the Islamic State and its path across a variety of social and economic cleavages, all of which highlight the expansive success of its radicalization tactics. Most obviously and perhaps most importantly, the drop of supporters’ median age from 35 to 26 signals the success ISIS has in reaching a younger audience, once again a facet of its effective social media campaign. According to the Pew Research Center, 86 percent of people between the ages of 19-29 utilize social media. The decrease in average supporter age by nine years is a testament to the success of ISIS in skillfully using social media. Ethnicity. Age is not the only shifting demographic. Indeed, the case studies of the NYPD report are marked by the distinguishing demographic feature of 30-something Middle Eastern men. In Madrid’s 2004 attack, London’s 2005 bombing, the attempted New York City Herald Square bombing, etc., all the perpetrators came from relatively middle class families from either the Middle East or Pakistan. The report even highlights the universities the men attended, types of families they grew up in, and even one fighter’s estimated estate worth in one case. By contrast, ISIS followers are “not confined to any ethnic group,” nor is their economic background the same. Supporters of ISIS represent a broad international spectrum, with some 40 percent being converts to Islam. Though the list of examples is long and diverse, ultimately all of them represent a fundamental shift in demographics from specific ethnic groups to the expansion of the jihadist Western radicalization movement. This variation of ISIS supporters attests to its success. Once again, its utilization of social media has granted it access to a number of ethnic groups and nationalities and has contributed to diversity among foreign fighters. While each phase is important in its own right, the greatest overlap for al-Qaeda and ISIS supporters occurs in the first stage: pre-radicalization. 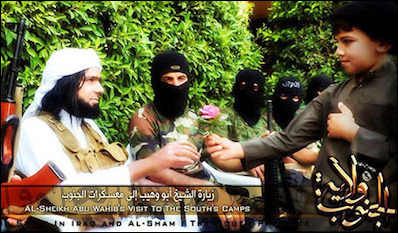 It is in this vulnerable stage that the exploration into jihad first begins; and despite the divergent radicalization tactics of the two terror groups, the pre-radicalized lives of their followers prove to be nearly identical, underscoring the unchanging nature of those most susceptible to jihadist indoctrination, namely individuals looking for the “meaning of life” and seeking identity. By and large, they lead ordinary lives but feel estranged from society and are motivated by an activist spirit. This loneliness, averageness, and desire for community are some of the key catalysts for seeking jihadist propaganda, and this narrative has hardly shifted with the rise of ISIS. German researcher Daniel Koehler, who evaluated three Somali-American teens who attempted to travel to Syria, found a number of pre-radicalization signs similar to those outlined in 2007, which he termed the “radicalization recipe.” A number of factors set off the process, including, “experiences of racism, bullying, lack of education. … anything that frustrates you and alienates you from your hosting society.” These vulnerabilities provide a fertile breeding ground for al-Qaeda and ISIS recruits alike. Accessibility helps ISIS. A final note about indoctrination worth mentioning is the role of travel. In many cases, travel to Middle Eastern countries can be a powerful mechanism in strengthening jihadist ideology within a person and providing training in how to commit to jihad. While al-Qaeda encouraged travel, and all the case studies examined by the NYPD report include individuals who traveled or attempted to travel, there are significant differences in the accessibility of these states. Afghanistan, for example, can be difficult to access while Syria and Iraq were, until recently, easier to reach with the largest entry point being through Turkey although the abortive July 2016 coup d’état there seems to have had a moderating impact. At least 51 percent of ISIS recruits since February 2014 traveled to or attempted to travel to Syria, providing greater access to its ideology and training. While the process of jihadist radicalization in the West is not unique to the twenty-first century, a comparison of the tactics used by al-Qaeda and ISIS highlights how it has rapidly evolved over a short period of time due to the introduction of new propaganda tools, most notably modern social media with its massive appeal to Western youth. Through an easily accessible social media campaign, using such platforms as Twitter, ISIS has succeeded in commanding the attention of millions. Its constant presence on the Internet has translated to greater recruitment rates than al-Qaeda, a younger demographic, and a more diverse ethnic base. At the same time, the triggers for radicalization and the steps leading to full jihadist indoctrination have remained virtually constant although occurring at a speedier pace with more diverse levels. There is no single successful methodology for identifying potential perpetrators, but continuing to monitor social media while creating a cyber counter-narrative campaign may be a powerful way to dissuade the young, vulnerable minds on which ISIS so successfully preys. *Mina Hamblet served as a research intern at The Jewish Policy Center and is currently at the University of Virginia. Mitchell D. Silber and Arvin Bhatt, “Radicalization in the West: The Homegrown Threat,” New York Police Department, 2007. Brian Michael Jenkins, “Virtual Dogs and Stray Armies: Radicalization and Recruitment to Jihadi Terrorism in the United States since 9/11,” The Rand Corporation, Santa Monica, Calif., 2011. Lorenzo Vidino and Seamus Hughes, “ISIS in America: From Retweets to Raqqa,” George Washington University Program on Extremism, Dec. 2015, p. 21. “Bank Al-Ansar,” MEMRI Cyber and Jihad Lab, Middle East Media Research Center, Washington, D.C., July 6, 2016. Vidino and Hughes, “ISIS in America,” p. 24. “Telegram ‘Nasheed Gallery’ Channel,” MEMRI Cyber and Jihad Lab, July 11, 2016. Jonathon Morgan and J.M. Berger, “The ISIS Twitter Census: Defining and describing the population of ISIS supporters on Twitter,” Brookings Institute, Washington, D.C., Mar. 5, 2015, p. 3. Sebastian Gorka and Katherine Gorka, “ISIS: The Threat to the United States,” Threat Knowledge Group, McLean, Va., Nov. 2015, p. 9. Gorka and Gorka, “ISIS: The Threat to the United States,” p. 2. Silber and Bhatt, “Radicalization in the West,” p. 24. “Social Networking Fact Sheet,” Pew Research Center, Washington, D.C., Jan. 12, 2017. Silber and Bhatt, “Radicalization in the West,” p. 26. Vidino and Hughes, “ISIS in America,” p. 6. Silber and Bhatt, “Radicalization in the West,” pp. 6-7. Daniel Koehler, interview, “Radicalization Recipe: Why Young People Are Drawn to ISIS,” Weekend Sunday Edition, National Public Radio, June 5, 2016. Silber and Bhatt, “Radicalization in the West,” p. 84. Vidino and Hughes, “ISIS in America,” p. 33. Silber and Bhatt, “Radicalization in the West,” p. 45. Gorka and Gorka, “ISIS: The Threat to the United States,” p. 7.